WhatsApp Bomber is a lightweight application available for Android, which helps anyone to send unlimited Messages to any number and crash their WhatsApp instantly. We all love to prank our friends using methods like SMS Bomber, Love Calculator Prank, etc. Today, in this article, we will be discussing pranking your friends by crashing their WhatsApp Application. Sounds cool, right? WhatsApp is the most used and popular instant messaging service used by a Billion+ users all around the globe. WhatsApp App helps you to connect with your friends and family members. We have shared a lot of WhatsApp tricks like Creating WhatsApp Account with US Number, WhatsApp without Mobile Number, etc. This one is also a trick related to WhatsApp that will let you crash your friend’s WhatsApp App. This trick will be perfect for those who are looking to prank their friends or family members for any reason. Having fun is always something we need and this trick is definitely gonna help you to successfully prank your friend without even having the need to access his/her phone. This trick is completely virtual and you are not required to get access to their device. All you want is just the number of WhatsApp that he/she is using on their device. 0.0.1 What is WhatsApp Bomber? A lot of might not be aware of the app/software called WhatsApp Bomber. Let me just briefly explain what it is. WhatsApp Bomber is simple App that is less than an MB in size. 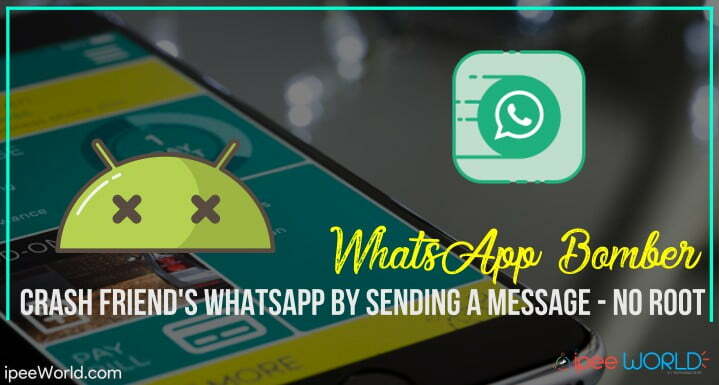 This will help you to crash anyone’s WhatsApp Application Hang, Crash or laggy by sending a combination of different messages to their number. Once the messages are sent and WhatsApp Bomber is executed, Instantly he/she will start to receive the messages on their device. As soon as they open it up, Boom. WhatsApp will get crashed automatically. Yes, that’s it. No matter where your friend is, whether he be in the United States, UK or India, this trick will work like a charm. A new method by which you can crash WhatsApp through Laptop or Desktop is also added below. After the first trick, if you wanted to Bomb WhatsApp via WhatsApp Web then move on to the next (2nd) method given below. Unknown Sources should be enabled to Install Unknown Apps – Go to Settings > Security and enable Unknown Sources. Working Internet Connection, it may be a Data pack or WiFi that doesn’t matter. Assuming you have all the requirements mentioned above, let’s get started. Step 1: Download and Install WhatsApp Bomber from the Above Link. Step 3: Now select Bombing level, You have 5 Different Levels to Crash WhatsApp.Level 1will be a Getting Started Level which will have very less Impact and If you choose Level 5 It will be very Complicated. While selecting Different Levels, Do remember if your phone has less than 1GB of RAM then do not select Level more than 3, Because it will Crash your WhatsApp also. Now WhatsApp Bomber will automatically copy some Text. Step 7: Now Paste the copied Message to Message Typing Box and click on Send button. As soon as your friend open that Message, his/Her Phone will be Hang and WhatsApp will automatically Crash within Seconds. How about pranking a group of people in a single go. If you want to prank a lot of people at once, Then the best method is to send the copied text to a Group and all of their device will get lagged. or even you can create a Group yourself and add all the members that you wanted to prank. After that send the text copied and boom all the participants of that particular group will get crashed. Never select Bombing Level 4 and5 if your Phone has less than 1GB of RAM. If you have Less than 1GB RAM on your Phone, then select Bombing Level 3. Immediately after sending this message Delete it from your Chat, Or else you will feel some lag when using WhatsApp as this message is still on your Phone. In this method, we will see how we can Bomb WhatsApp with the help of WhatsApp Web version. This method is also pretty simple and straightforward. So, let’s get into it. This is an interesting and simple trick by which you can send unlimited messages to any number. Whether it be a long or short message, we are going to send it multiple times to number to overcome the Read More problem. By this way, you can Spam your friend’s WhatsApp. You can also download GBWhatsApp to get amazing features like custom themes, which is not available in normal WhatsApp. #For this trick to work your need Microsoft Net Framework 4 or above installed in your Computer. Firstly, Download and Install Auto Spam Bot 2.0 on your Computer from the link given. Now you will see a field to enter the message of your choice.You can send it unlimited times. So type any message in the field as you like. Then tap on the Start button in the software. Now it will start to send messages at high speed to the selected chat. There might occur some lagging issue after the trick has been executed. To solve that issue you can simply just follow the ste[ps mentioned below and it will completely remove all the issues related to lagging and hanging. Now Click on Force Stop Button. This is exactly how we use WhatsApp Bomber to crash anyone’s WhatsApp application by continuously sending series of messages with just a single click. This method works like a charm, I have personally tried it on one of my phones and it worked fine. This way, you can easily prank your friends and Family members in no time. If you want to prank multiple persons at a time when you can send this message to a WhatsApp Group and every participant’s device will get hanged. Also be sure to check out 1000+ WhatsApp Group Name Ideas. thanx a lot dude.. finally i have got Whatsapp Bomber for which i was looking from past few days. The Link mentioned in the Article is working fine and it is hosted at Google not on Mediafire. Please Try Again!